Indoors or out, in the greenhouse or sunny winter window, in a permanent perennial planter or summer container – wherever you want a creeping or trailing succulent – there’s a sedum to suit your purpose. These are perfectly delightful plants, with thick, leathery or juicy leaves, flowering happily in the sun and thriving on neglect. The hardy types may be evergreen, but always adaptable to growing indoors. 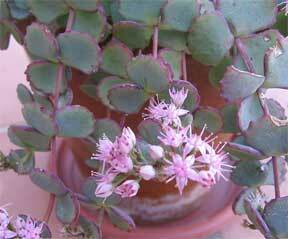 Sedums need all possible sunlight and coarse, sandy soil. Indoors, they like cool temperatures (55 degrees) but will take more warmth if necessary. Water regularly except during the brief rest at the end of the flowering period. Propagation is by spring-sown seeds, which make flowering plants in two or three years, offsets, division, pieces of stem planted without prerooting, and mature leaves laid on moist soil or sand. Sedum acre – Hardy, evergreen, matting creeper with tiny, oblong, light-green leaves and half-inch yellow flowers in spring or summer. Sedum dasyphyllum – Also hardy, evergreen, and matting, with fat, 1/8 inch, oval, blue-green leaves, pink-tinged white flowers in early summer. Seldom as much as two inches high. To increase your plants or make a miniature ground cover, simply sprinkle the tiny leaves on the soil. Sedum lineare variegatum – Evergreen trailer with small, slim leaves margined or nearly covered with creamy white; starry yellow flowers in summer. Delightful in a basket or small compositions. The plain-leaved species is also available. Sedum mexicanum – Evergreen trailer with half-inch green leaves and yellow flowers, excellent in pots, baskets, all kinds of containers. Sedum morganianum – burro’s or donkey’s tail – Silvery green leaves closely packed around stems that trail to three feet, like heavy, swinging chains. Does not flower frequently, but who cares? A newly introduced hybrid has yellowish green leaves tinged with red. Sedum palmeri – Spreading, drooping branches with frosted one-inch leaves, orange flowers in early spring. Sedum sieboldi – Reliably hardy garden perennial with wandering stems, one-inch rounded leaves arranged in threes and touched with blue or red. Pink flowers in fall. Pretty in a basket. Sedum spectabile – Hardy perennial with three-inch oval leaves sometimes in pairs, sometimes threes; pink flowers in fall. Sedum stahli – Boston bean, coral beads – Tender, low evergreen with eight-inch trailing stems; beanlike red-copper leaves packed tight around the stem; half-inch yellow flowers in summer and fall. Leaf coloring is brightest in lean soil and full sun.